← Swim is on ! This post has jumped the queue, but better to do it now, while the iron is hot so to speak. Queue is a generous term. Its a queue of one. My English Channel post is almost there, just haven’t had the pics to supplement it. Last Sunday, due to the trojan work of Fergal Somerville and John Daly, another chance was given to us to complete the Ice Mile. 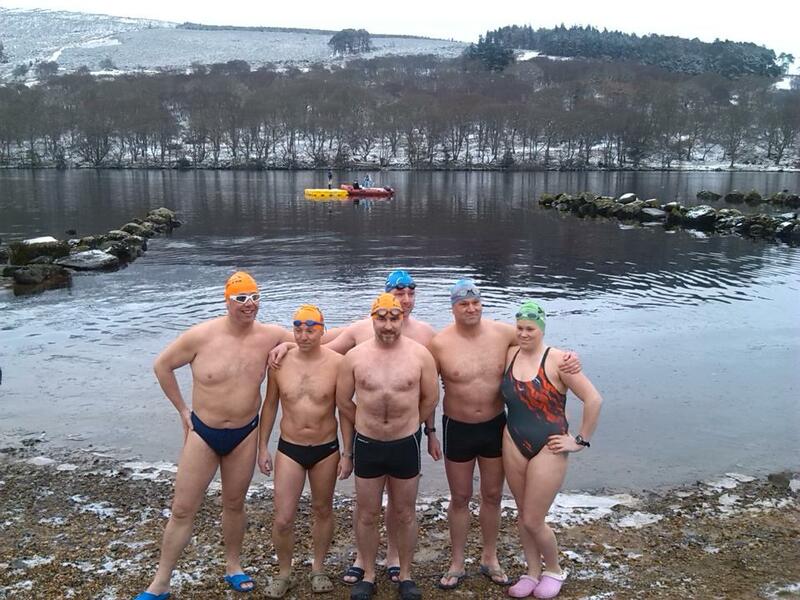 An Ice mile is a swim of 1 mile in water of 5 degrees C or less. Not for the faint hearted. We had previously attempted this during the last cold spell, about 2 weeks previously, in Dollymount along the Bull Wall, but that time the water temperature wasn’t cold enough. That time it was about 7 degrees. We got in and swam it anyway, but knew it wouldn’t count. 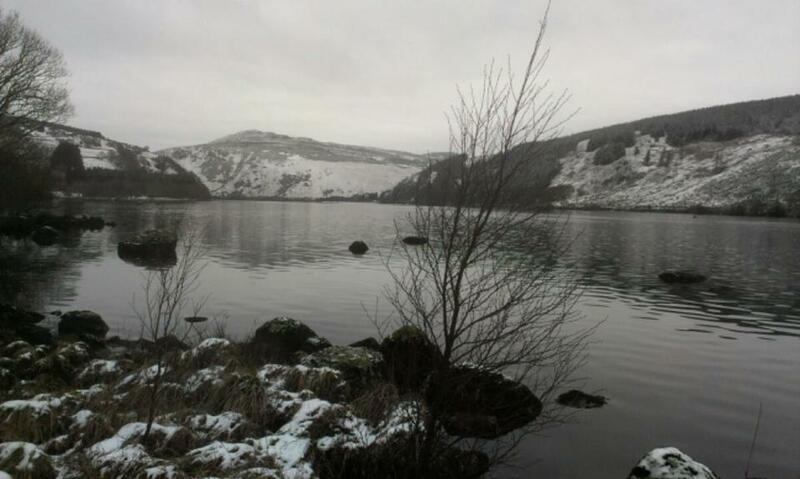 This time, a new venue was decided upon, Lough Dan, up in the Wicklow hills. The weather forecast was cold for the few days leading up to the swim, and as luck would have it, there was snow the day before. So, as long as the snow wasn’t too bad and we could actually get there, we were almost certainly guaranteed water below 5 deg. Luckily, only the last few miles were snowy and it was easy enough to get to the lake. We arrived around 9, and went down to have a look. Ice on the waters edge ! Brilliant. A first for me. Water temp measured on the watch left in for a few mins was 2.3. I have this watch calibrated to adjust for the temperature variation caused by heat from my wrist, so you can add about 1 degree to this as a reasonably accurate value. So with a water temp around 3 degrees, the swim is definitely on. This is definitely a spot that’s worth another visit. So the swim is 1609m, so this was marked out by using the existing pontoon as a start / turn / finish point and swim a straight line course to a marker buoy located 200m away down the lake. This gives a 400m round trip, so 4 laps of this course gives 1600m. Given the pontoon was about 30m away, from the edge of the lake, made up almost an extra 60m, so giving well over the required distance. Here’s a video I put together, showing the nitty gritty of the swim. The water didn’t seem “that” cold. Everything is relative here remember. Don’t get me wrong, it WAS bitterly cold, but I was expecting worse once we got in and started swimming. I had done a swim in 6 deg in Dunmore East, for about 15 mins, the day before as a “topper upper”, and felt that biting hard. As the water temperature drops below about 10 deg and continues to drop, I liken every 1 deg lower than this to another increased level of pain or discomfort. I had never swam in anything below 5 deg before, so I didn’t know what to expect with 3 deg. I suppose the adrenalin that comes from facing such a challenge definitely helped. Also, the water was warmer than the air, so maybe that helped too. Some more thought needed here as to why that was the case. I didn’t go flat out in an attempt to keep warm. My normal pace is about 62 strokes per minute and a reasonable speed for me in warm open water (no tumbles) would be about 4.2 KPH. So as can be seen from the video, I started off at just over 4KPH, which seemed about right. Not too fast, that you get breathless after a few mins, not too slow that you start to get cold early on. I kept my normal breathing pattern of 3 or 4 breaths to the left, then 3 or 4 breaths to the right the whole way through. During the safety briefing, Tom Healy had said the water here was very peaty and dark, and he was right. Although there was good visibility, as I could read the time on my watch underwater, the bottom of the lake must have been very dark, as there was nothing to see beyond your arm. This was in contrast to the view above water, where everything was covered with snow. So every breath was like switching from day time to night time, weird. The swim was split into 4 laps, of 200m up and back, so that was a nice number to count. Not too many that you risked loosing count as you become disoriented, not too few that the laps seem too long and you wonder are you ever going to get to the end. Also, as the swimmers were never more than 200m apart, it made sense from a safety point of view. For those of you who haven’t yet swam for long periods in cold water, you need to be aware that as your body gets cold, it doesn’t function as you would like it to. This is both from a mental and physical point of view. Everything slows down, brain and body. As you lose muscle control due to the cold, your stroke deteriorates. When your stroke starts to fail, your speed drops, and your swim starts to drag on and on. Your last 100m will be a lot slower than your first. I’ve seen people who, when cold, are only about 50% of their warm speed. So I had a plan that I would keep talking to myself, constantly assessing my mental state to see if I started to “go off”. Also I would continuously monitor my stroke, every pull, to make sure that it stayed normal and efficient. I don’t know how possible it is to monitor your own mental state, certainly when you’ve tipped over the line and are sliding into hypothermia, you cannot be your own judge, but I was working on the assumption that before I went down the slippery slope, I would begin to notice something that would raise a red flag for me. I should state that for me, this swim was a controlled experiment in hypothermia. Almost certainly, I would be cold coming out. Almost certainly I would need assistance getting dressed as my fingers wouldn’t work. Almost certainly, I wouldn’t have attempted this without having the support that was there, both expert assistance on the water and both medic and paramedic on land. Needless to say, a swim like this should only be attempted after a long period of acclimatization and building up progressively longer periods in cold water. I’m of the opinion that almost anyone can do it, as long as they prepare for it. The more you practice anything, the better you get at it. To my mind, cold water swimming is no different. So, the actual swim. First lap. Water cold, but not too bad. Walking out through floating ice to get sufficient depth to swim in. No immediate sensations of pain in fingers or toes. The fact that the water was warmer than the air certainly helped. I was last to start, so all the swimmers were in front of me. Donal went to the left, Fergal and co to the right, and I was bang in the middle (in my mind anyway). Fingers started to hurt by the first turn, about 3 minutes. They usually hurt sooner, so this is good. I notice a modern house built into the side of the mountain on our left. Covered with snow, but lots of glass. Must be a fantastic view. Reach the turn with goggles fogged up, so a quick stop to rinse and then back down the lake to complete the first lap. I hope I don’t swim head first into anyone. Make it to the end of the first lap, 400m done. Stroke feels good. Goggles clear. I note there is almost no kick. My legs just seem to be fluttering and not giving any significant propulsion. OK, point noted. Am a bit wary to kick hard in case of inducing cramp in my feet. Foot cramps seems to be a problem this season. Down the second lap I have the sensation that my hands actually feel very flat while pulling, like I’m wearing paddles. This is a first. Point Noted. Little finger behaving itself and staying in position. To those inexperienced, as your arms cools down, the finger muscles in your forearm are affected, resulting in your little finger being pulled away from your other fingers. Something like “the pinkie must protrude”. This is usually one of the early warning signs that you’re getting cold. Try as you might, you just can’t pull it back in. Another test is can you touch all your fingers in turn with your thumb. Index finger is easy, but little finger gets progressively harder as you get colder. Second lap done. Half way. No going back now. Field of swimmers well spread out now. One note of concern approaching the 200m mark on the third lap. I start to feel a warm sensation in my chest. This has happened several times before, and I use it as another warning sign. I think of it as the last attempt by your body to warm up and is a sign that you’re nearer to the end of your swim than the beginning. Point noted. We are swimming around the turn buoy,and its awkward to make the turn, it would be much easier to touch it and swivel around, like we do at the pontoon. Fingers numb but will clench in and out. Pinkie is behaved and stays in position. Strange that. Third lap done. 400m left. Can’t stop now. Fingers pretty much useless now, but stroke still feels good. Slightly short, but I feel I’m maintaining a stretch on the catch and getting a good bit of power on the pull. I slow down my stroke slightly to ensure I still have a good catch and pull. I’m still talking to myself and feeling good. Excited now that the end is coming and I’m going to finish. Stop on the last turn, quick chat with kayaker who has pulled in near the buoy and then head down and swim to the finish. Looking for the exit point now, a narrow boat channel beside the rocks. If I find this, I will be able to swim most of the way in and not have to walk on the stones. Make a mental note to stand up before it gets too shallow. Job done. Stand up. Catch Toms hand and he guides me out. He wraps me in my towel, feels nice and warm. My fingers definitely almost useless now. As agreed with Warren and Seán beforehand, a quick dry off at the waters edge, coat and boots on and then walk up to the car, which has had the engine running with the heater and heated front seats on full blast. Nice and toasty. I go to the boot and sit down. No way the togs is coming off standing on one leg. Another quick dry off, a double layer of clothes on, hat and coat and boots. Having a dresser is a luxury. Then into the front seat to start the shivering and process of warming up my core. Refuse a cup of sugary tea for now. No way I would hold it steady enough to drink it. After about 30 mins of top quality shivering, it starts to ease off and by 45 mins the shivering stops completely and I’ve had at least one cup of tea. Grand. So final thoughts. Bitterly cold, but not as cold as I was expecting. Would I do it again? Definitely. Would I do more than 1 mile? Most likely. I would have definitely managed another 400m at least. How much further? Who knows. Some things will just have to wait…..
ps. I’ve felt increasing muscular pains, yesterday and today, down both sides / ribs and stomach. Maybe due to the longer bout of shivering? Interesting point about the little finger, I shall watch out for that. What I hate most about cold water swimming is not the shivering it is the cold finger that runs down my spine afterwards, it is very unpleasant.